This is Horseshoe Bend in Glen Canyon just south of Lake Powell. That's the Colorado River down below. 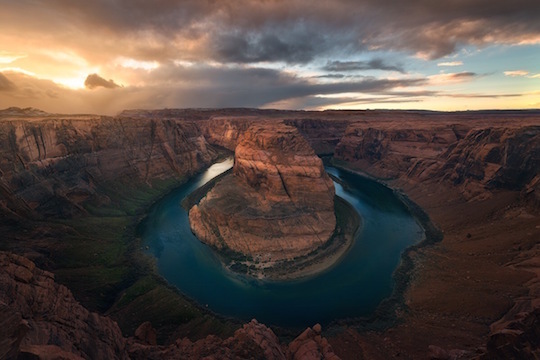 Glen Canyon becomes Marble Canyon which becomes the Grand Canyon. Yes, it really looks that way. Sometimes it looks even stranger. Although it is hard to see in this light, this canyon is full of life. This is an overlook. There is no path down the canyon from this angle. There are rafting companies that launch at the base of Glen Canyon Dam and go to Lee's Ferry. It's a nice day trip that shows some of what is there. The animal life is really amazing. Watching the birds catch the wind currents is awe inspiring. I found this picture on the Earthporn subreddit, I've linked to the (much bigger) original.